Keith Alexander Laught, ‘ambassador for Mount Gambier’, was born on 2 January 1907 at Mitcham, Adelaide. He was the elder of two surviving sons born to Alexander Veitch Laught, a telegraph clerk, and his wife Johanne Christiane née Wittber, a potter whose work is held in the Powerhouse Museum in Sydney. One of his uncles was Bill (Carl) Wittber, the aviation pioneer, and Keith’s brother Reg recalled being taken to Parafield in 1915 to witness practice take-offs of an aeroplane built by Wittber. In 1924 Laught entered the law school at the University of Adelaide and was awarded his LLB on 14 December 1927. Admitted to the South Australian Bar in 1928, he moved to the mid-north town of Clare and began practice as a barrister and solicitor. There he married Josephine Faith (Jo) Hackett, of Sevenhills, on 22 April 1935. Jo was an Anglican, and the wedding took place at St Mark’s Church of England, Penwortham, although Keith remained a staunch Presbyterian. The couple participated fully in country life, including membership of community and church organisations, notably the Clare Institute, of which Keith was president in January 1936, the local town council and the Masonic Lodge. In 1938 Laught sold his Clare practice and the couple moved to Mount Gambier, where Laught joined the legal practice that became Davison, Hunt & Laught. Laught served with the Citizen Military Forces in the 27th Battalion from 1925 to 1928 and with the 3rd Light Horse Regiment from September 1939. On 6 July 1940 he volunteered for the AIF and joined the 9th Division Cavalry Regiment, embarking for the Middle East on 10 April 1941. By 1942 he was a corporal, serving in Syria and Egypt, including El Alamein, and enduring enteritis, sand fly fever, and bouts of spondylitis. Disembarking in Sydney early in 1943, he was classified as medically fit for restricted duties only, attending a course in military law for officers and potential officers in Brisbane; war records state that, handicapped by his physical condition, he did not qualify, and was discharged on 1 January 1944. Returning to Mount Gambier, where he collected his ‘returned from active service badge’, Laught was nursed back to health by Jo. He resumed his legal practice with Davison, Hunt & Laught and in 1946 joined the Legacy Club of Adelaide. He was a stalwart of the Mount Gambier sub-branch of the RSL, where he served a term as president, and became a member of the state council. 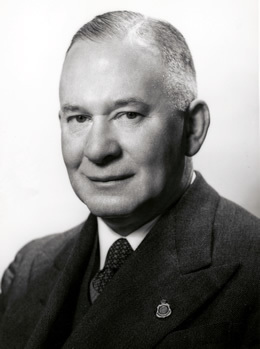 Laught had been secretary of the Clare Men’s branch of the Liberal and Country League (LCL) in the 1930s, and later held office on the Mount Gambier district committee, representing it on the LCL state executive from 1946 to 1951, and serving as district committee president from 1948 to 1957. On 23 March 1951 he announced that he was standing for preselection for the Senate, following the simultaneous dissolution of the two houses of federal Parliament on 19 March. He was chosen by the Liberal Party’s South Australian executive for fifth position on the ticket behind Rex Pearson and re-endorsed Senators George McLeay, Ted Mattner and Clive Hannaford. Locals hailed him as likely to be the first senator from Mount Gambier. Successfully returned at the election of 28 April, his three year ‘short-term’ was backdated to 1 July 1950 in accordance with section 13 of the Constitution. His first speech on 20 June could be said to be that of a lawyer from a small state—a history of the Constitution and attempts to change it, warnings against the creeping power of central government and a call to regain the true federal system. Development was another theme, and he spoke warmly of South Australia’s Premier Playford and the state government’s ‘determination and drive’, notably in developing the Leigh Creek coalfields. He urged better provision of transport and pointed out the agricultural potential of the Coonalpyn Downs, praising the Commonwealth Scientific and Industrial Research Organisation’s experiments in pasture regeneration. Within a year Laught was a member of the government members’ committee on taxation and, as its chairman for eleven years, spoke frequently on taxation matters in Parliament, suggesting an overhaul of the Tax Act in 1955 and urging reform of the principles of taxation. In 1960 he flew to Perth to open the annual conference of the Federated Taxpayers’ Association of Australia. Standing again in 1953, at the first Senate election to be held separately from a general election, Laught campaigned vigorously around the state, earning a rebuke from the local ALP branch secretary for implying in an election broadcast that Labor and the communists were virtually indistinguishable in their espousal of socialism. Although the coalition vote was down, Pearson and Laught were returned, along with three Labor senators. Within days Laught was appointed by the Minister for Territories, Paul Hasluck, to lead an official party of six backbenchers to Ocean Island and Nauru as representatives of the British Phosphate Commission, the month-long trip proving, he said, ‘a great education’. From February 1956 to August 1962 Laught was a member of the Senate Standing Committee on Regulations and Ordinances. The committee’s long-term chair, Senator Ian Wood, recalled Laught as being the only committee member in that period who opposed a decision of the committee in the Senate. When on 4 October 1960 government senators Wood, Wright and McKellar crossed the floor of the Senate to disallow three defence finance regulations, which validated payments retrospectively, Laught remained to vote with the Menzies Government. Doubtless this did him no harm. From August 1964 until his death in office he served as a temporary chairman of committees. Laught was little inclined to either independence or opportunism. In 1957, seconded by Pearson, he argued against the Government’s Commonwealth Grants Commission Bill. This was on the grounds that it contravened the original 1933 Act by putting remuneration of the commissioners into the hands of the executive, thereby rendering them not ‘entirely free from political or governmental interference’. He urged other senators from the ‘smaller States’ to turn down this ‘fundamental alteration … [as] wrong in principle’, and was successful to the extent that ten coalition senators (including all five from South Australia) and three Democratic Labor Party senators did so, although the second reading still passed by thirty-eight votes to thirteen. Laught then supported the amendment moved by Senator Wright to have any such remuneration made only by regulation, suggesting that, given his experience on the Regulations and Ordinances Committee, this was an effective way for Parliament to retain some control. The amendment was lost, but five more coalition senators had crossed the floor. Laught was spared any repercussions because his stand did not result in defeat for the Government, and the incident played well to the home crowd, being reported in the Adelaide Advertiser of 7 September under the heading: ‘S.A. Senator in Defence of State Rights’. Selected as one of the six Australian delegates to the July 1958 conference of the Inter-Parliamentary Union in Rio de Janeiro, Laught was bowled over by South America. It was a continent about which he rightly complained Australians knew very little, a situation he thereafter attempted to remedy. When there was talk later of sending a small trade mission to South America, Laught was keen that all such missions be accompanied by members of Parliament, to add, as he said, ‘status and standing’. Laught was easily returned in second position on the LCL ticket for the election of 22 November 1958, and headed the ticket in December 1964 at what was to be his last election. In 1959 the strain of travelling over 400 miles to Adelaide on indifferent roads before flying to Melbourne and then Canberra had led Laught and his wife to move to Adelaide, just as Jo was completing two years on the Mount Gambier Council as its first female member. They settled at Glenunga, a mere ten minutes from Keith’s Commonwealth offices in King William Street, and he continued to practise law. A man of broad interests, though always spruiking for his home state, he became one of the two Senate representatives on the council of the Australian National University, with Dorothy Tangney, in November 1959. He advocated the establishment of an Institute of Technology at Whyalla in South Australia, and in 1969 he was made chair of the Florey Memorial Fund in South Australia, formed to raise funds for Florey Fellowships for post-doctoral research in bio-medicine. Other interests included civil aviation, the South Australian space research sites at Woomera and Salisbury, mining (he was a member of the government members’ mining committee) and bauxite deposits at Weipa. He supported the extension of Commonwealth aid for the building of science laboratories, and in 1965 opened a heavily subsidised science block at the Wilderness School for girls in Adelaide. Peter Howson, a member of the Menzies, Holt and McMahon governments, has claimed that Laught was never considered to have ministerial potential. Be that as it may, his attributes as a backbencher were deployed usefully: in April 1962 he was part of a parliamentary delegation visiting Port Moresby for Anzac Day celebrations and in August was appointed to the Joint Committee on Foreign Affairs. In 1963 he was on a 12-person backbench delegation that visited six South-East Asian countries in the mid-year break. He was disappointed not only at the lack of attention this trip received in the Australian media, but also that not a single Australian newspaper had a journalist stationed in Indonesia. The highlight of Laught’s parliamentary career was his involvement in the conversion of Australia’s weights and measures from imperial to metric. As early as 1960 he was espousing the advantages of decimalising the currency. When the Senate approved the formation of a select committee on the metric system in April 1967, Laught was the only speaker after the two party leaders and was elected chair of the new committee. The first hearings were scheduled for 8 May in Parliament House, with visits to state capitals to follow. On 29 May 1968 Laught presented his report to the Senate, stressing that it was unanimous, and that it was ‘practicable and desirable for Australia to adopt the metric system of weights and measures at an early date’, as recommended. In 1969 Keith and Josephine went on a world tour. On their return, Laught was disappointed to find his report ‘gathering dust’. On 4 March 1969 Laught moved for the formation of a subcommittee of the Joint Committee on Foreign Affairs to consider the South Pacific region, and on its formation became its chairman. Sadly, he did not live long enough to see the outcome of this committee, nor of that on weights and measures. On the morning of 13 May 1969 he collapsed and died while walking from the Hotel Canberra to Parliament House in the company of Senator Cormack, the Senate adjourning for the rest of the day following the brief announcement of his passing. The funeral took place on 16 May at Tusmore Presbyterian Church, Adelaide, followed by burial at St Jude’s Cemetery in the seaside suburb of Brighton. Jo never remarried and died in 2008 at the age of 98. Laught had been fortunate to spend his entire parliamentary career as a member of the party in government, spared the irrelevancies and impotence of opposition. In many ways a conventional man, with all the virtues—courtesy, diligence, sobriety and kindliness—of a man of his times and background, he also shared its prejudices and vision, taking cover in the argument of ‘gradualism’. On the subject of equal pay for work of equal value, for example, he took a typically legalistic line, arguing, in the debate on Dorothy Tangney’s attempt to get the Government to implement its international obligations, that it was up to the trade unions to make moves in the Conciliation and Arbitration Commission, this being ‘a matter for gradual movement after investigation and debate’. The recommendations of the weights and measures committee became law in 1970. The adoption of the metric system in Australia is Laught’s principal legacy. Border Watch (Mount Gambier), 13 May 1969, p. 24; Damian Lataan and Reg Laught, Those First Australian Flights: Bill Wittber’s Contribution to Australian Aviation History, D & S Publications, Hahndorf, SA, 1993, pp. 1–3; The editor is indebted to Jo Hoskins, Archives Coordinator, Unley High School; Scotch College Magazine, Dec. 1969, p. 115; Keith Alexander Laught, Student card, series 1117, University of Adelaide Archives; Scotch College Magazine, Apr. 1955, p. 7, Dec. 1956, p. 6, 15 Sept. 1936, p. 36; Northern Argus (Clare), 1 July 1938, p. 3; Scotch College Magazine, Oct. 1955, p. 6. ALJ, 15 May 1928, p. 27; Northern Argus (Clare), 17 Jan. 1936, p. 7, 15 Dec. 1933 (supp. ), 22 July 1938, p. 7, 8 July 1938, p. 3. Laught, Keith Alexander—Defence Service Record, B883, SX8260, NAA; Border Watch (Mount Gambier), 13 May 1969, pp. 1, 24, 27 Mar. 1951, p. 1; The editor is indebted to Jock Chambers, Executive Officer, Mount Gambier Community RSL. Border Watch (Mount Gambier), 27 Mar. 1951, p. 1; Liberal Party, SA division, Records, SRG 168/1/28, 43–4, SLSA; Advertiser (Adel. ), 24 Mar. 1951, p. 3; Border Watch (Mount Gambier), 31 Mar. 1951, p. 1; CPD, 20 June 1951, pp. 82–6; Advertiser (Adel. ), 16 May 1952, p. 2, 14 May 1969, p. 3, 20 Oct. 1955, p. 6, 27 Feb. 1959, p. 5, 5 May 1960, p. 2. Border Watch (Mount Gambier), 9 May 1953, p. 12, 14 May 1953, p. 5, 23 May 1953, p. 1; CPD, 21 Oct. 1953, p. 785. Ian Alexander Christie Wood, Transcript of oral history interview with Ron Hurst, 1984, POHP, TRC 4900/84, NLA, pp. 3:10, 4:21–3; Senate, Journals, 4 Oct. 1960, p. 134, 11 Aug. 1964, p. 102. CPD, 5 Sept. 1957, pp. 183–9, 1 Oct. 1957, pp. 271–2, 278, 283; Advertiser (Adel. ), 7 Sept. 1957, p. 2. Border Watch (Mount Gambier), 26 Aug. 1958, p. 1; CPD, 26 Feb. 1959, pp. 228–30, 232–3, 15 Mar. 1960, pp. 157–8. Senate Registry File, A8161, S150, NAA; Border Watch (Mount Gambier), 4 June 1959, p. 1, 13 June 1959, p. 1. CPD, 10 Nov. 1959, p. 1350, 28 Oct. 1963, p. 1482; Papers of the Florey Memorial Fund Committee, 1969, M979, NAA; CPD, 13 Oct. 1964, pp. 929–32, 29 Aug. 1967, p. 275; Advertiser (Adel. ), 11 July 1960, p. 16; CPD, 21 May 1964, pp. 1407–11, 21 May 1965, pp. 1069–72; Advertiser (Adel. ), 18 Sept. 1965, p. 14. Peter Howson, The Howson Diaries: The Life of Politics, ed. Don Aitkin, Viking Press, Ringwood, Vic., 1984, p. 90; Advertiser (Adel. ), 18 Apr. 1962, p. 8; CPD, 16 Aug. 1962, p. 234, 28 Aug. 1963, p. 268, 17 Sept. 1963, p. 594. Advertiser (Adel. ), 13 July 1960, p. 10; CPD, 5 Apr. 1967, pp. 557–8, 29 May 1968, pp. 1219–21; CPP, 19/1968; Ray Aitchison, From Bob to Bungles: People in Politics 1966–70, Sun Books, Melbourne, 1970, p. xviii. NAA, Agency notes, CA 1529, viewed 3 Mar. 2009, <http://www.naa.gov.au/>; Border Watch (Mount Gambier), 13 May 1969, p. 1; CPD, 13 May 1969, pp. 1177–80; Advertiser (Adel. ), 15 May 1969, p. 42; Author interview with Josephine Laught, 2006. CPD, 18 Oct. 1967, p. 1363; Scotch College Magazine, Dec. 1969, p. 115, June 1962, p. 89; South Australian Presbyterian, Nov. 1960, p. 1; Advertiser (Adel. ), 24 Dec. 1962, p. 12; CPD, 9 June 1970, pp. 2150–61, 12 May 1970, pp. 2015–16. This biography was first published in The Biographical Dictionary of the Australian Senate, vol. 3, 1962-1983, University of New South Wales Press Ltd, Sydney, 2010, pp. 197-201.